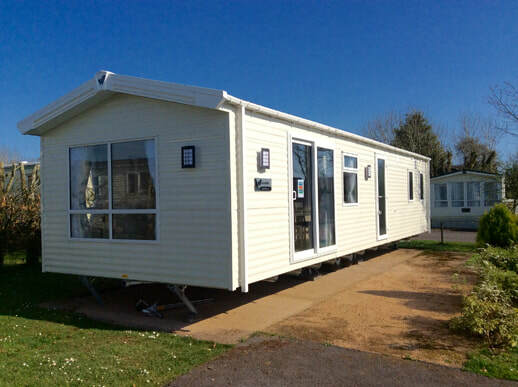 This holiday home is one of Willerbys newest additions, it is spacious and roomy with a modern colour scheme. The lounge area has L shape seating along with a separate arm chair and feature fireplace. The kitchen has plenty of cupboards and worktop space with microwave and fridge freezer and modern extractor. The dining area is free standing which allows for greater flexibility. The master bedroom is large and has ample storage along with en-suite facilities. The second bedroom is also spacious due to the holiday homes extra width. The family shower room is larger than in similar sized units and offers a modern luxury feel. The Canterbury also comes with matching bending packs for the twin beds and kingsize in the master bedroom. The Canterbury is double glazed and is centrally heated making it comfortable to use in the winter months. The Canterbury comes with side patio door that will lead out onto the extensive side balcony which enjoys a sunny location. We also include a caravan skirt, gas locker auto regulator, axel stands, siting, delivery, chain down and digital ariel in the price. The plot also enjoys Tarmac parking next to the holiday home. This unit is available to view now.